I came across this and really loved it. 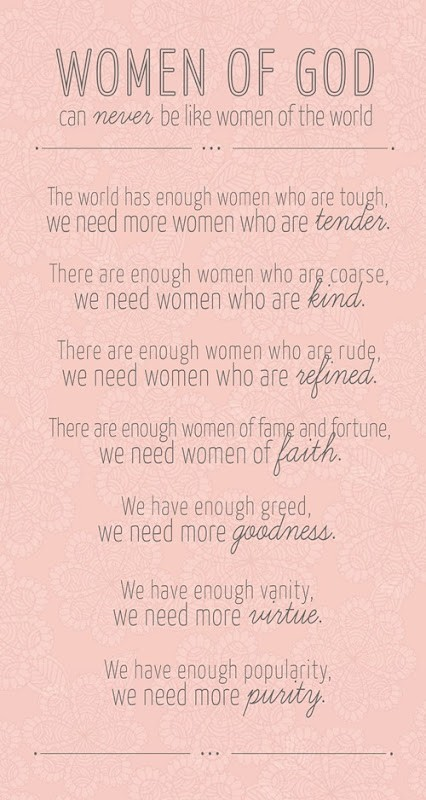 It is true ladies, we can never be like women of the world. We need to live in accordance to the Holy Book of God. Reading this reminded me that we are different in every aspect of our lives. Everything the World represents is opposite to what God desires of us. 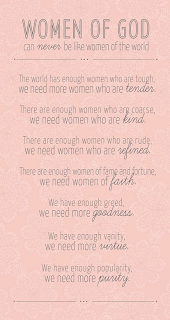 The world doesn’t need any more worldly women, it needs more Godly women! Represent the God you serve with Pride, make a difference in your community, workplace, school with everything you are (actions & dress). The world doesn’t need any more women dressing immodestly, it needs more ladies like you and I. Enough is Enough, this world doesn’t need any more darkness, will you continue to stand out and be the light?!?!? Even if it’s only YOU in your workplace, school or community, don’t doubt that you are making a difference! You are in more ways than you could possibly think. And don’t feel awkward either because you are different! If so many people team up out there to do wrong things and things that bring no benefit to humanity, we can certainly team up and keep being a difference, a light in this dark world and shine the Love of Christ on all. We can be an example in the way talk, dress, and speak in front of others. The World needs to see God in us! In my workplace, I'm the only one who of this Faith, sometimes it can be discouraging to know, you are the only one that’s different, not just in the way you dress, but in every aspect! And what I mean by discouraging is, knowing that people don’t want anything to do with God and they are so enwrapped in sin. However, you can think about it this way, you are one person less this world has got a hold of! And maybe, just maybe, in due time, if you remain the light, those people will remember you are different and seek you to ask you about your God in their time of need. I’ve had this happen!!! I pray you are encouraged to keep on fighting this good faith battle!